Botulinum rejuvenation is a procedure that take years of age off the appearance of the face or neck by reducing the appearance of lines and wrinkles. Skin Relaxing Injections is now one of the most popular cosmetic treatments in the U.K. , as the injections are quick, and usually have minimal side effects. What areas are most commonly treated ? In some cases, we can inject botulinum toxin into another cosmetic area to help diminish signs of aging. Botulinum rejuvenation also may be used along with another cosmetic procedure to give you a more youthful appearance, most commonly fillers. Small amounts of botulinum toxin are injected into the targeted muscles, using a very small kneedle. The botulinum toxin blocks nerve signals to these muscles, which temporarily relaxes the muscle and diminishes the unwanted lines. Each injection takes just a few seconds. This procedure does not require resting time , however it is advisable to refrain from strenuous physical activities, or bending forward / down, and lying flat or on the side for several hours after the procedure (6-8 hours) in order to minimise the risk of toxin migration , a very rare occurrence. Makeup may be applied after the treatment, but avoid massaging or pressing on the area for several hours ( same reasons as above ). When will I see results from Botulinum Rejuvenation? Results are not immediate. You can expect to see the effects about 3 to 7 days after treatment. This procedure is incredibly effective , with the right dose and application and effectively reduces the appearance of lines on the face in areas like crow’s feet , forehead and Glabella . Botulinum rejuvenation is a well-tolerated procedure, another reason for its popularity. Some patients may have a temporary headache after injections in the forehead area, especially after the first treatment. Mild bruising or soreness may occur around the injection site but this is not usually a problem. In very rare cases, a patient may develop weakness in nearby muscles, leading to a temporarily droopy brow or eyelid. All of these effects are mild, reversible, and fade with time. Generally, the results last about 3 to 4 months. As the effects gradually fade, the muscle action returns and lines are seen. Treatment can usually be repeated as the effects wear off. Any other blood thinning medications including Warfarin and Clopidogrel. However you need to consult your doctor about stopping any medications as the risk of doing so may out weigh the benefit of stopping it for cosmetic purposes. NSAIDs (Non-steroidal anti-inflammatory drugs) These medications reduce pain, fever, and inflammation. Again, if you are taking a NSAID, do not stop taking it without consulting with your doctor. But before receiving an injection of botulinum toxin, be sure to tell your dermatologist if you are taking a NSAID. During your initial consultation at the clinic , be sure to mention all of the medications ( including those bought over the counter), vitamins, and herbal remedies that you are taking. While botulinum toxin causes botulism food poisoning, you cannot get food poisoning from these injections. Botulinum Toxin injections in expert and skilled hands are a safe and effective treatment , not only as a proved anti ageing treatment but also for other medical conditions such as axillary hyper hydroids ( excessive sweating ). hyaluronic acid gel injections generated by Streptococcus species of bacteria. It is produced biotechnologically by natural fermentation in a sterile laboratory environment. This significantly diminishes the risk of transmitting diseases between species or of eliciting allergic reactions in patients who are sensitive to common foods, such as beef, chicken and eggs. Restylane ( only hyaluronic acid product used by Dr Diaz ) does not require any allergy or skin test prior to injection. Restylane is indicated for mid-to-deep dermal implantation for the correction of moderate to severe facial wrinkles and folds, such as nasolabial folds. Restylane is also indicated for submucosal implantation for lip augmentation in patients over the age of 21. 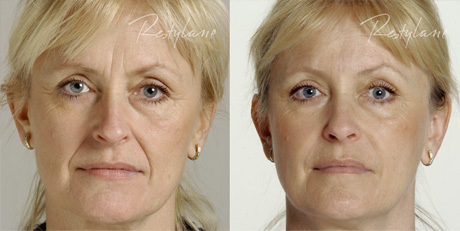 Restylane is gradually degraded by the body’s own mechanism and disappears without any residue. Results can be seen immediately following Restylane treatment and for up to six months. Some patients may achieve results that last longer than six months, depending upon injection site.